UChicago, Argonne National Lab, Fermilab prepare for quantum information revolution. Argonne, the University of Chicago and Fermilab are launching an intellectual hub called the Chicago Quantum Exchange to advance academic, industrial and governmental efforts in the science and engineering of quantum information. 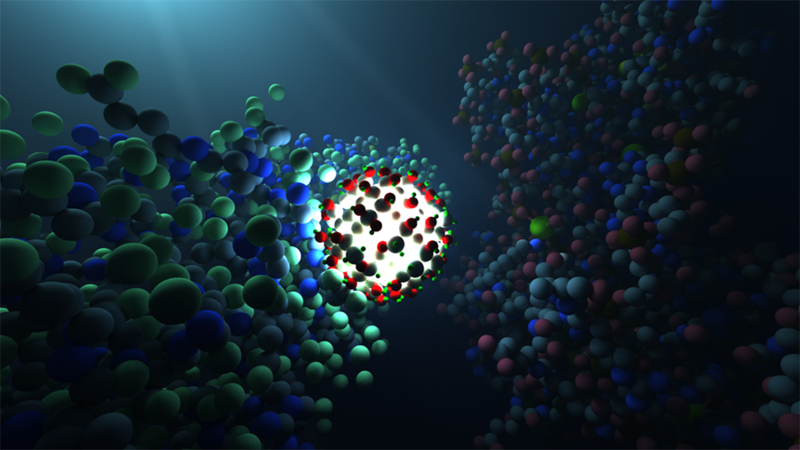 Above: An illustration of a blinking quantum dot in its 'on’ state. (Image courtesy of Nicholas Brawand). This new quantum ecosystem will provide a collaborative environment for researchers to invent technologies in which all the components of information processing – sensing, computation, storage and communication – are kept in the quantum world, Awschalom said. This contrasts with today’s mainstream computer systems, which frequently transform electronic signals from laptop computers into light for internet transmission via fiber optics, transforming them back into electronic signals when they arrive at their target computers, finally to become stored as magnetic data on hard drives. IME’s quantum engineering program is already training a new workforce of ​“quantum engineers” to meet the need of industry, government laboratories, and universities. The program now consists of eight faculty members and more than 100 postdoctoral scientists and doctoral students. Approximately 20 faculty members from UChicago’s Physical Sciences Division also pursue quantum research. These include David Schuster, assistant professor in physics, who collaborates with Argonne and Fermilab researchers. At Argonne, approximately 20 researchers either conduct quantum-related research or express interest in joining the field. Many of them have joint appointments at the laboratory and UChicago. Fermilab has about 25 scientists and technicians working on quantum research initiatives related to the development of particle sensors, quantum computing and quantum algorithms. Argonne and UChicago already have invested approximately $6 million to build comprehensive materials synthesis facilities — called ​“The Quantum Factory” — at both locations. Guha, for example, has installed state-of-the-art deposition systems that he uses to layer atoms of materials needed for building quantum structures. Fermilab also is working to increase the scale of today’s quantum computers. Fermilab can contribute to this effort because quantum computers are complicated and sensitive cryogenic devices. The laboratory has decades of experience in scaling up such devices for high-energy physics applications. Fermilab is America’s premier national laboratory for particle physics and accelerator research. A U.S. Department of Energy Office of Science laboratory, Fermilab is located near Chicago, Illinois, and operated under contract by the Fermi Research Alliance, LLC. Visit Fermilab’s website at www​.fnal​.gov and follow us on Twitter at @Fermilab.